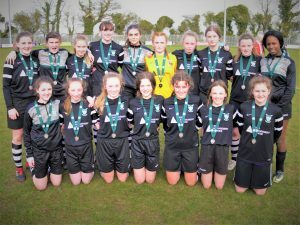 HANOVER Harps U16 girls lost out in their quest to clinch All-Ireland victory on Sunday in Tullamore. It has been a magnificent journey for the Calrow town club who have represented themselves with pride during the season but on the day it was Dublin kingpins Peamount who got over the line in a hard-fought battle. The pre-match build-up saw both teams line up on the field where they were introduced to FAI delegates including Colin Bell, manager of the Irish senior women’s team. Hanover captain Fia Murphy introduced her team to the delegates and once the national anthem was played it was time for kick off in front of a large crowd which included huge support for the Carlow club. Hanover took the game to Peamount right from the start and earned a free kick on the edge of the box early in the game. Kelly O’Neill hit the free just over the bar. Hanover pressed Peamount high up the pitch and stopped them from playing out from the back. The lively Emma Walker and Wiktoria Gorczyca were closing down well and winning possession for Hanover but they could not create any clear-cut chances. Peamount then began to come into the game and they had a dominant spell where their quick strikers looked a threat but the Hanover defence of Kate McDonald, Megan Monahan, Niamh Lalor and Niamh Brophy stood strong and never gave Peamount a proper opportunity. Hanover weathered Peamount’s period of possession and Katie Byrne down the left wing started to find some room while Kerrie Smith and Kelly O’Neill started to regain the upper hand in a fiercely fought midfield battle against a Peamount midfield which included a number of Ireland internationals. Hanover looked a real threat getting in behind the Peamount defence. The Carlow club won numerous corners and free kicks and looked a real threat from set pieces. They were extremely unfortunate not to have been awarded a penalty when Kate McDonald was clearly pushed in the back from a brilliantly delivered corner from Kelly O’Neill. Then came the defining three minutes of the match when Peamount scored twice just before half time. The first goal was a through ball that the lightning fast Orlaigh Fitzpatrick got on the end of and calmly finished low to the corner of the net. Minutes later a strong shot from outside the box was brilliantly saved by Fia Murphy in the Hanover goal but Orlaigh Fitzpatrick reacted quickest to the rebound and slotted home her second goal. The Hanover team were cheered off the field at half time and again when they emerged for the second half from the vocal travelling support who were playing their part in trying to get behind the girls to rally a second-half comeback. On the restart Hanover again brought the game to Peamount knowing that if they got the next goal it would make a great finish to the game. Hanover again looked dangerous from set pieces and Walker and Gorczyca were looking dangerous and keeping the Peamount defence on their toes. Hanover changed formation and went three at the back and three up front to try to score the goal that would get them back into the game. The change nearly worked straight away when Siofra Adams went down the right wing beating two Peamount defenders and she delivered a great cross with Walker and Gorczyca bearing in on goal. Unfortunately for Hanover the Peamount keeper got to the ball first. Walker then won a free kick on the edge of the Peamount box but McDonald’s free kick hit the Peamount wall. Soon after, Gorczyca intercepted a poor goal kick and hit a volley that just cleared the crossbar. Peamount were always a threat on the break with the pace they had up front and with Hanover now playing three at the back. But Sarah Timmons was having a great game along with the brilliant Niamh Brophy to prevent any chances for Peamount and anything that did get past them was gathered by the ever alert Fia Murphy. Hanover kept going forward in search of a goal and Siofra Adams sprinted through on goal but was denied by the outrushing Peamount keeper. Hanover never gave up hope and nearly pulled one back with their last attack when a brilliantly delivered corner from Walker looked to be going straight to the head of McDonald but a brilliant clearance from Jess Stapleton denied Hanover a goal and victory went to Peamount. Even in defeat the huge Carlow support were vocal in their appreciation of the huge efforts that the Hanover girls had given not just in the final but throughout the entire competition and the Hanover girls received huge cheers as they lined up to receive their All Ireland runners up medals from Colin Bell.